It might be best to have hidden files viewable in organize, folder and search options, while tracking the problem. Perhaps reset explorer first then check changes before and after inducing problem. After starting windows, allow it a bit of time, do not start any programs. Then open a problem folder and close. Open Starter, click on process tab then click on explorer.exe in the top view window this should bring up a list of files underneath in the lower window. Click on a file in the explorer list in the bottom window then click on top File tab, there will be a save as HTML or TEXT. HTML looks better but will need browser to look at it. Do the same thing after resetting explorer remember to refresh the starter view with refresh button if it was still running. Compare the two saved files from Starter for files that are missing after explorer reset, this will give the clues to what starts up and prevents the deletion etcetera. Same thing can be done with services that become active before and after. One of the 1st things I do when I used RT7 Lite (now NT Lite, assuming if it's still available) to remove M$'s bloat is to unhide everything that is hidden. In an earlier post in this thread Goodmaneuver mentioned a program called Codestuff Starter. It is to that program that he is referring. He said you might find it easier to use than Autoruns. I guess I did, thanks. Autoruns is a bit involved, but current. As interesting as this appears, it's 10 years out of date (v5.6.2.9 2009). Isn't that a issue? Then open a problem folder and close. Open Starter, click on process tab then click on explorer.exe in the top view window this should bring up a list of files underneath in the lower window. Under the "Processes" tab, there is no Explorer entry. The startup tab doesn't list what MS Config does (there are also two under Services in MS Config that aren't there also). Autoruns is a bit involved, but current﻿.﻿﻿﻿ As interesting as this appears, it's 10 years out of date﻿ (v5.6.2.9 2009). Isn't that a issue? When I was checking out 'Starter' one comment left on a download site referred to Starter as abandonware. Autoruns does look very involved, especially with some of the more advanced stuff it can do. However, if you just want to (temporary) switch off some stuff that loads at bootup just look on the 'Logon' tab and you will get the list there. If you don't want anything to run during bootup/logon just untick the necessary box and it will not run. In that sense Autoruns is likely just as simple as Starter. I read through all of the How-To Geek's tutorial on Sysinternals tools once. 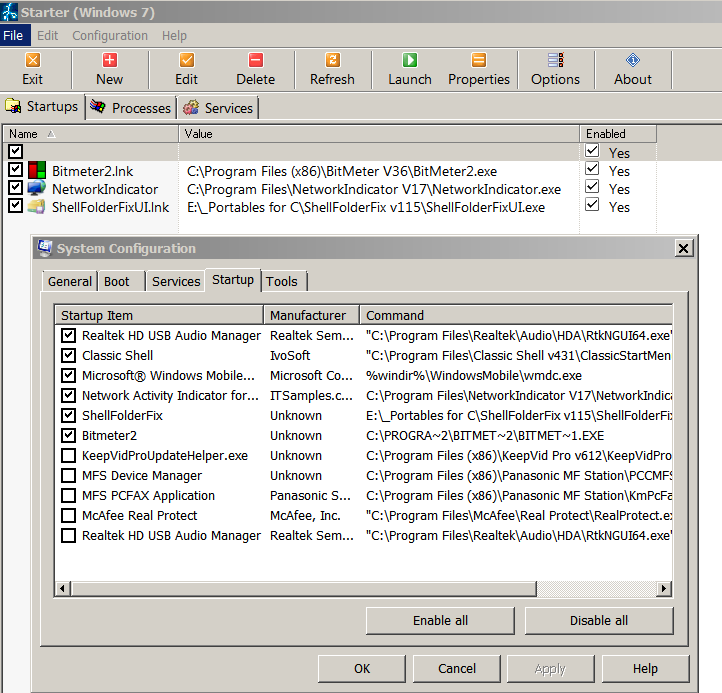 I didn't understand it all but I did get enough out of doing so to find the GUI of Autoruns and Process Explorer a bit less intimidating and confusing. I'll trying reading through it again later, but a bit more slowly and taking notes. Just take it one step at a time, Bruce, and you might work out how to solve your issue (assuming you are ferreting in the right place). But I agree, if Starter is failing to find stuff then it doesn't sound like a reliable tool to me. On my own system I did check on what MSCONFIG was showing as 'Startup' items and what Autoruns was showing under the Logon tab. Autoruns reports everything that MSCONFIG was reporting plus some Microsoft items that weren't reported in MSCONFIG Startup items - I doubt very much if there would be any need to disable those Microsoft items anyway, they all look pretty well like essential system files to me and Autoruns does mark them as 'Verified' and hence not a possible suspect for being hijacked in any way. What Are the SysInternals Tools and How Do You Use Them? There is no such thing as "abandonware", at least not from MS/Adobe/Oracle/Apple. Probably not, but "Starter" is from someone/somewhere else and after 10 years of no updates, "abandon" surely qualifys. I am going to remove Panda, it's only a backup A/V program, it's not active (per say, but those 2 processes running when not really doing anything doesn't cut it for me. Starter, its OK. In options, interface select show information panel, show startup selection tree, show service groups tree. I should have said Processes tab the next along, Explorer.EXE will be there sort alphabetically by clicking Process tab straight above the list. 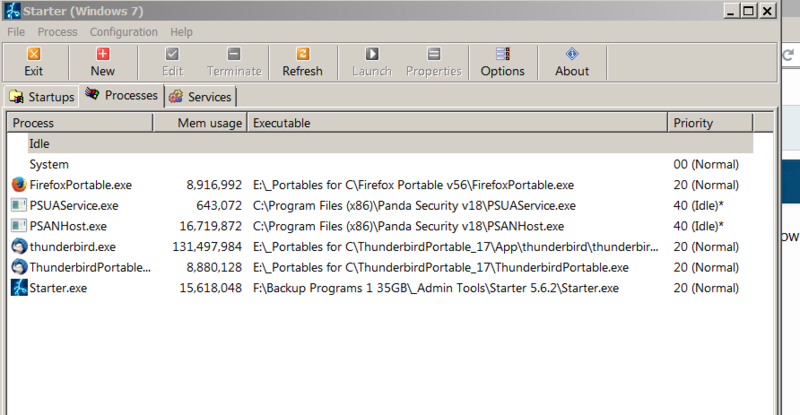 From what you have shown I would untick the E:\ShellFolderFixULink startup unless you are using it right at the moment. I hope you have manual system restore point placed as it will be dangerous disabling some startup functions. Starter shows user startups see the left tree list. It is safer to just disable these. Sorry missed the processes shot. Explorer should be there unless it is not running. My system shows many more. I know RT7 means a lot to you but having exceptions occurring means that the program is not that compatible or has a memory leak or something the mods are vast. The type column is showing the registry program association used for programs so that you can easily assign file types to startup with a specified program. For example Video Clip could be assigned to WMP. ShellFolderFix has to run, same goes for ClassicShell it retains the 'Classic' (2k) look. I disabled both, but the problem remained. I took a screen shot of Process Hacker in normal mode and Safe Mode to compare the differences. BTW; Explorer was running, I had a folder opened at the time. 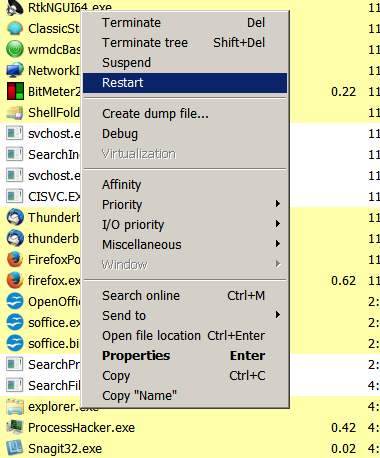 ShellFolderFix has to run, it 'fixes' Windows not remembering Explorer position and size. That is suspect﻿. Are you saying ShellFolderFix is what is causing your issues? No, I corrected that previous post. I've tried to find some kind of pattern. It seems, folders with .exe's are the prime target. I can open folders with images (.jpg, .png etc), then close and there is no issue re-naming. Folders that have programs in (not installed, just original backups), even just opening, then closing will cause the lockup. BUT, not always. I also removed Panda with those 2 loaded programs that I couldn't stop (by their design). I'm going to try a shot at AutoRuns. ProcessHacker & MS Config aren't cutting it. I use them since they are reasonably easy to read, understand & use. BTW; I found that using ResourceHacker (or similar) by choosing "Restart" for explorer.exe, under Processes, that will break the hold (or hook) that prevents the change. So far it's worked more than once. There are also shortcuts that can be created, attached to a script to do similar, thou I haven't tried those yet.